Barkingside 21 : King George Hospital Earmarked for Closure? 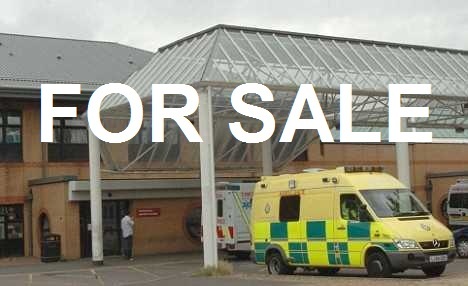 King George Hospital Earmarked for Closure? When the entire King George and Goodmayes Hospital sites were earmarked to be taken out of Green Belt status, alarm bells were ringing in my ears. This act, which took effect with the Local Development Plan (LDF), voted through by Redbridge Council (unanimously I recall) and approved by the Planning Inspector makes the land on which these hospitals stand, Prime Real Estate for housing development. Our local Health Trust is in severe financial difficulties and they are now sitting, literally, on a gold mine. What do you expect them to do? When the local health services campaigner, Andy Walker, repeatedly suggested that these sites would be used for housing development he was accused by the council Leader, Jas Athwal, of scaremongering. Scaremongering, def: Telling people what is likely to happen when our elected representatives don’t want you to know. The first tell-tale sign came earlier this year when the health authority was accused by none other than Redbridge Council itself (you gotta laugh) of creating uncertainty over the future of the A&E unit at King George Hospital when they were the very people who gave them the opportunity to do just that. The health authority has basically refused to commit to the Review of the decision to close the A&E that was promised just short of a year ago. And here we come to the crucial piece of evidence. The new way of working to relieve the pressure on A&E units and hospital beds is Ambulatory Care. If you want to know what that is you can look it up yourself, but according to Andy Walker it does have some rave reviews, so that’s a good move, right? Well, it would be, but. There’s always a “but”. The North East London Trust has announced let slip that it will be rolling out Ambulatory Care Units right across North East London and there will be one unit in every single hospital – EXCEPT King George. Now why would they do that? Well, there’s not much point in providing a brand new unit in a hospital that is earmarked for closure, is there? It’s not just the A&E that is under threat now, it’s ALL of it. I can just see the estate agents’ blurb. Come to Redbridge and buy a luxury home, oh by the way there is no hospital if you get sick or have an accident and no maternity if you get pregnant, but it’s a luxury home so we expect you to have private medical health care and if you don’t here’s my mate Discount Damian. Other than that, you can rest assured that Redbridge Council and our MPs are “working hard behind the scenes”. Oh yeah! Here’s a petition, sign it if you think it might make any difference. 1,500 signatures means it must be debated on the agenda and ignored at a Full Council meeting. There’s also a Public Meeting on Sunday afternoon on 25th November 2018. Are they just giving the Land away for peanuts like all the over Hospitals before all the Mental health Hospitals wich had acres of land and hoo is getting a back hander, someone should look into. Are they so very short sighted as Queens cannot cope over the Winter period this was highlighted last year. If the land is sold and housing is built where will all the extra residents be treated as there will be no hospital. Is the Government so short sighted and just a money grabbing excercise with no thought for health care.